The report examples shown in the following sections are a result of analyzing the com.acme and org.apache packages in the jee-example-app-1.0.0.ear example application, which is located in the RHAMT GitHub source repository. The report was generated using the following command. Use a browser to open the index.html file located in the report output directory. This opens a landing page that lists the applications that were processed. 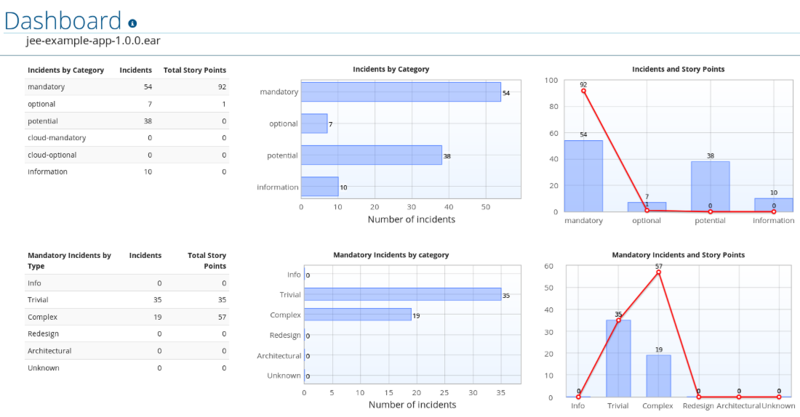 Each row contains a high-level overview of the story points, number of incidents, and technologies encountered in that application. The incidents and estimated story points change as new rules are added to RHAMT. The values here may not match what you see when you test this application. The following table lists all of the reports and pages that can be accessed from this main RHAMT landing page. Click on the name of the application, jee-example-app-1.0.0.ear, to view the application report. Click on the name of the application. Click on the Technologies link at the top of the page. Click on the Dependencies Graph link at the top of the page. Click on the Archives shared by multiple applications link. Note that this link is only available when there are shared archives across multiple applications. Click on the Rule providers execution overview link at the bottom of the page. Click on the FreeMarker methods link at the bottom of the page. Click on the Send Feedback link in the top navigation bar to open a form that allows you to submit feedback to the RHAMT team. Note that if an application shares archives with other analyzed applications, you will see a breakdown of how many story points are from shared archives and how many are unique to this application. Information about the archives that are shared among applications can be found in the Archives Shared by Multiple Applications reports. Access this report from the report landing page by clicking on the application name in the Application List. The top navigation bar lists the various reports that contain additional details about the migration of this application. Note that only those reports that are applicable to the current application will be available. Provides a concise summary of all issues that require attention. Provides a detailed overview of all resources found within the application that may need attention during the migration. Displays all embedded libraries grouped by functionality, allowing you to quickly view the technologies used in each application. Displays a graph of all Java-packaged dependencies found within the analyzed applications. This graph also demonstrates the relations of each dependency, allowing you to view nested and multiple dependencies. Displays all Java-packaged dependencies found within the application. Shows all files that RHAMT could not parse in the expected format. For instance, a file with a .xml or .wsdl suffix is assumed to be an XML file. If the XML parser fails, the issue is reported here and also where the individual file is listed. Displays all remote services references that were found within the application. Contains a list of EJBs found within the application. Contains all of the JBPM-related resources that were discovered during analysis. Contains details on all JPA-related resources that were found in the application. Contains details on all Hibernate-related resources that were found in the application. Displays all server resources (for example, JNDI resources) in the input application. Contains a list of Spring beans found during the analysis. Provides a list of all hard-coded IP addresses that were found in the application. Lists the files found in the application that, based on certain rules and RHAMT configuration, were not processed. See the --userIgnorePath option for more information. Describes the current version of RHAMT and provides helpful links for further assistance. Access this report from the dashboard by clicking the Issues link. This report includes details about every issue that was raised by the selected migration paths. The following information is provided for each issue encountered. A title to summarize the issue. The total number of incidents, or times the issue was encountered. The rule story points to resolve a single instance of the issue. The estimated level of effort to resolve the issue. The total story points to resolve every instance encountered. This is calculated by multiplying the number of incidents found by the story points per incident. Each reported issue may be expanded, by clicking on the title, to obtain additional details. The following information is provided. A list of files where the incidents occurred, along with the number of incidents within each file. If the file is a Java source file, then clicking the filename will direct you to the corresponding Source Report. A detailed description of the issue. This description outlines the problem, provides any known solutions, and references supporting documentation regarding either the issue or resolution. A direct link, entitled Show Rule, to the rule that generated the issue. Issues are sorted into four categories by default. Information on these categories is available at Task Category. Access this report from the dashboard by clicking the Application Details link. The report lists the story points, the Java incidents by package, and a count of the occurrences of the technologies found in the application. Next is a display of application messages generated during the migration process. Finally, there is a breakdown of this information for each archive analyzed during the process. Expand the jee-example-app-1.0.0.ear/jee-example-services.jar to review the story points, Java incidents by package, and a count of the occurrences of the technologies found in this archive. This summary begins with a total of the story points assigned to its migration, followed by a table detailing the changes required for each file in the archive. The report contains the following columns. The name of the file being analyzed. The type of file being analyzed, for example, Decompiled Java File or Properties. Warnings about areas of code that need review or changes. Level of effort required to migrate the file. See Rule Story Points for more details. Note that if an archive is duplicated several times in an application, it will be listed just once in the report and will be tagged with [Included Multiple Times]. The story points for archives that are duplicated within an application will be counted only once in the total story point count for that application. Access this report from the dashboard by clicking the Technologies link. The report lists the occurrences of technologies, grouped by function, in the analyzed application. It is an overview of the technologies found in the application, and is designed to assist users in quickly understanding each application’s purpose. The below image shows the technologies used in the jee-example-app. 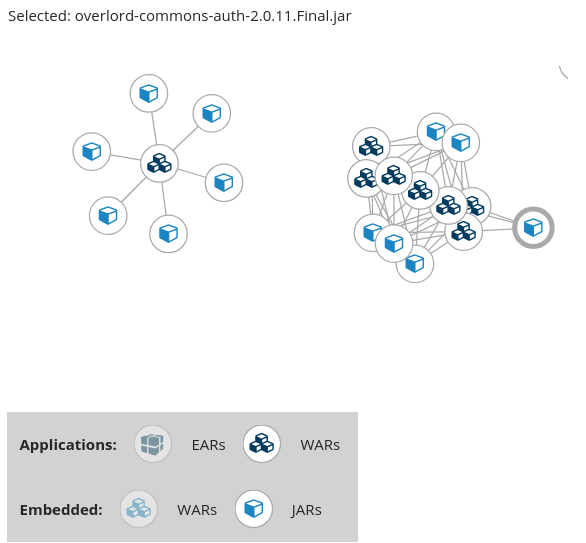 The analyzed applications' dependencies are shown in this report, accessible from the Dependencies Graph link from the dashboard. It includes a list of all WARs and JARs, including third-party JARs, and graphs the relations between each of the included files. Each circle in the graph represents a unique dependency defined in the application. 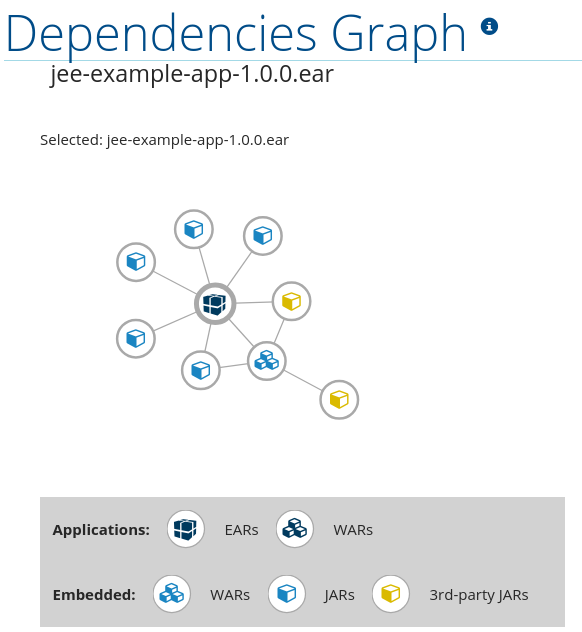 The below image shows the dependencies used in the jee-example-app, with the selected application in the center of the graph. The dependency graph may be adjusted by using any of the following. Clicking a dependency will display the name of the application in the upper-left corner. While selected the dependency will have a shaded circle identifying it, as seen on the center in the above image. Clicking and dragging a circle will reposition it. Releasing the mouse will fix the dependency to the cursor’s location. Clicking on a fixed dependency will release it, returning the dependency to its default distance from the application. Double clicking anywhere will return the entire graph to the default state. Clicking on any item in the legend will enable or disable all items of the selected type. For instance, selecting the embedded WARs icon will disable all embedded WARs if these are enabled, and will enable these dependencies if they are disabled. The analysis of the jee-example-services.jar lists the files in the JAR and the warnings and story points assigned to each one. Notice the com.acme.anvil.listener.AnvilWebLifecycleListener file, at the time of this test, has 22 warnings and is assigned 16 story points. Click on the file link to see the detail. The Information section provides a summary of the story points. This is followed by the file source code. Warnings appear in the file at the point where migration is required. In this example, warnings appear at various import statements, declarations, and method calls. Each warning describes the issue and the action that should be taken. Access this report from the report landing page by clicking the Technologies link. This report provides an aggregate listing of the technologies used, grouped by function, for the analyzed applications. It shows how the technologies are distributed, and is typically reviewed after analyzing a large number of applications to group the applications and identify patterns. It also shows the size, number of libraries, and story point totals of each application. Clicking any of the headers, such as Markup, sorts the results in descending order. Selecting the same header again will resort the results in ascending order. The currently selected header is identified in bold, next to a directional arrow, indicating the direction of the sort. Access this report from the report landing page by clicking the Dependencies Graph link. It includes a list of all WARs and JARs, and graphs the relations between each of the included files. Each circle in the graph represents a unique dependency defined in the application. If a file is included as a dependency in multiple applications, these are linked in the graph. In the below image we can see two distinct groups. On the left half we see a single WAR that defines several JARs as dependencies. On the right half we see the same dependencies used by multiple WARs, one of which is the seelcted overlord-commons-auth-2.0.11.Final.jar. Access these reports from the report landing page by clicking the Archives shared by multiple applications link. Note that this link is only available if there are applicable shared archives. This allows you to view the detailed reports for all archives that are shared across multiple applications. 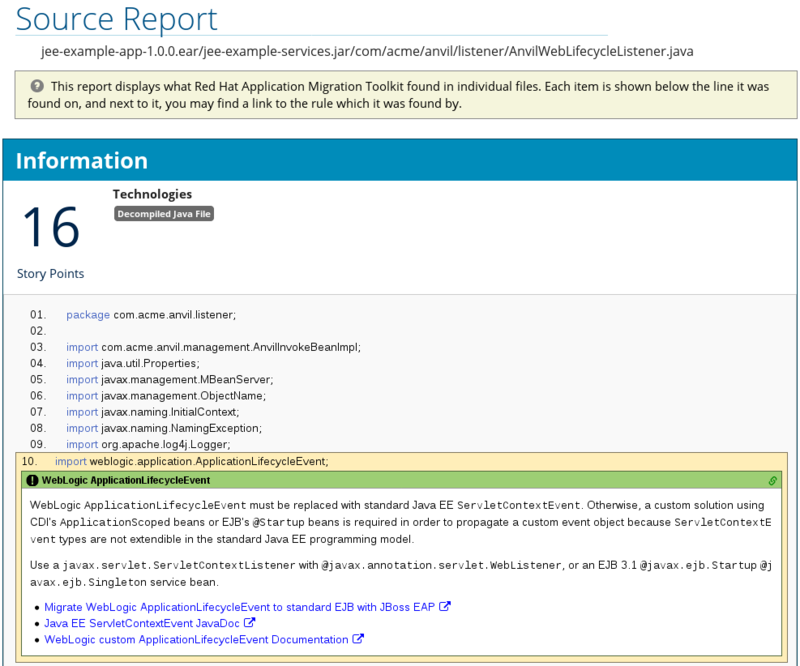 Access this report from the report landing page by clicking the Rule providers execution overview link. This report provides the list of rules that executed when running the RHAMT migration command against the application. 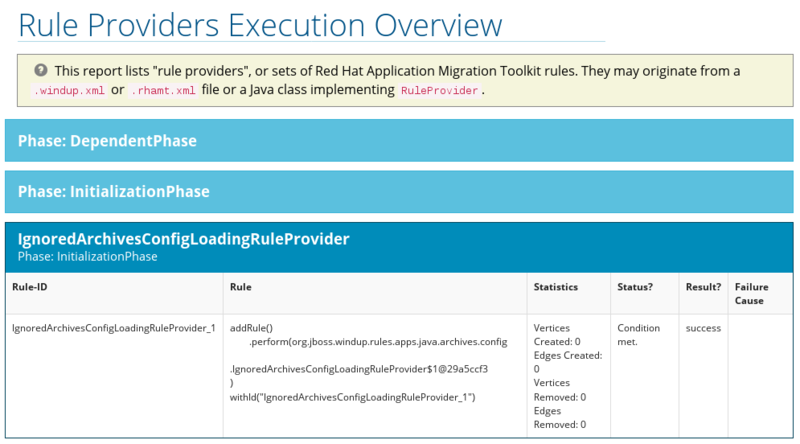 Access this report from the report landing page by clicking the Red Hat Application Migration Toolkit FreeMarker methods link. This report lists all the registered functions and directives that were used to build the report. It is useful for debugging purposes or if you plan to build your own custom report. 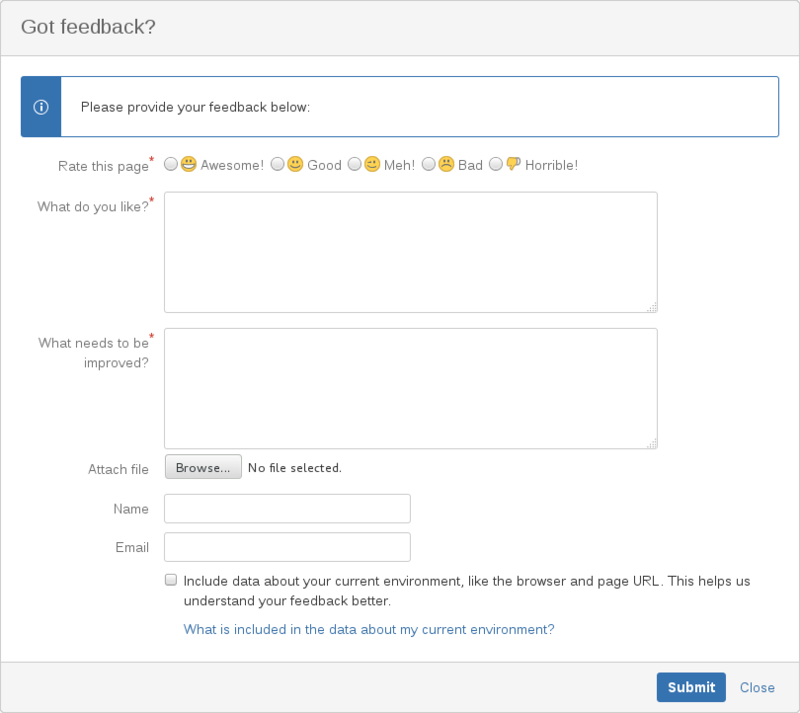 Access this feedback form from the report landing page by clicking the Send feedback link. This form allows you to rate the product, talk about what you like, and make suggestions for improvements.